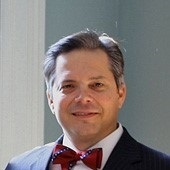 A Florida native who moved back to his childhood home of Virginia, Christopher Kachouroff has resided in Chesapeake, and Northern Virginia since 1995. While in Chesapeake, he attended Law School at Regent University where he participated in Moot Court and was a member of the Law Review. Upon moving to the D.C. metro area to work as a Law Clerk in the United States Court of Federal Claims, he attended and received his LLM from Georgetown University and currently resides in the Gainesville area with his wife and children. For more than 15 years, Chris has been in private practice. His varied legal experience includes estate planning, business, contract, real estate law and personal injury with extensive jury trials and over 1000 bench trials in both state and federal courts. Prior to his legal career, he served in Law Enforcement and in the United States Military. He has operated his own small businesses and advised large and mid-sized, private corporations with regard to asset protection and succession. Chris is licensed to practice law in Virginia. Mr. Kachouroff is not affiliated with Voya FInancial Advisors. Voya Financial Advisors does not provide legal advice nor services.